The ability to do pretty much anything you want when installing a swimming pool in your backyard only comes when you have plenty of space. A backyard that has a lot of open space, or enough space that you can clear, will allow you to go with a custom design shotcrete swimming pool in Pennsylvania. This is what’s known as a free-form design and is rare, especially if your home is older. Those who are having a home built often go with a free-form design with a swimming pool because of the space available. When you decide to use shotcrete to build your pool, you can choose the shape of the pool. So, if you want to shape the pool like a guitar, an oval, a rectangle, or anything to your liking; you can do so when you use shotcrete. The team at Coronado’s Pool Renovations, Inc. has the experience necessary to build you a custom pool with shotcrete. Shotcrete is a wet material, but it is not too wet to be applied to the standing walls of the pool. When you decide to go with shotcrete for your pool it takes less time to install than using concrete or gunite. When shotcrete is installed in your pool it will provide you with a strong and consistent coating along all of the walls and the floor. 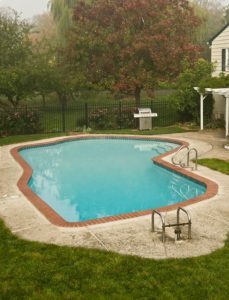 Since the installation time is less than the use of concrete or gunite, you can expect to have your pool ready quicker for your first swim. The cost of shotcrete is higher than using gunite for your pool, but when it is applied correctly it will last longer and provide you with a much more attractive finish. The installation process for shotcrete is quick. You cannot start installing shotcrete and then stop, as this can wind up causing the finish to crack. Cracks can also develop if too much water is added to the mixture when installing shotcrete for your pool. Are you ready to have a pool custom built for your home? Call the team from Coronado’s Pool Renovations Inc. today at 215-723-5885 to schedule an appointment. Your pool project will become our top priority as you prepare your backyard for the upcoming summer season. Contact us today for your free estimate.